Big in the US and finally arriving in Britain… Eye-Fi cards make it easy to transfer data – pictures whatever between your camera and your computer. Eye-Fi cards look like normal memory cards but are capable of making any camera with a memory card slot internet-enabled. The advantages are obvious: cameras can now automatically upload photos and videos from your camera to your computer or the web. All it requires is a Wi-Fi connection. You can of course set what online sharing sites you want your data to go to. The device has been massively popular in the US – cutting out USB cables and the fiddly bits involved with transferring video and photos between cameras and computers. Get family and friends updated automatically. 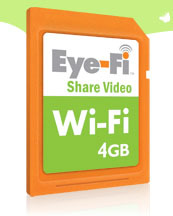 The Eye-Fi Share Video card makes saving and sharing effortless by automatically and wirelessly uploading photos and videos to the user’s computer and to the web. Users can pick where their memories go, and can choose from popular websites like Flickr, Facebook, Picasa, MobileMe or YouTube – no need for the computer to be turned on for memories to be shared online. Don’t want to share it all with everyone? The Selective Transfer option, available for all Eye-Fi cards, enables users to control which media will be wirelessly uploaded. Photo enthusiasts and professional photographers can now streamline their workflow. The Eye-Fi Pro card wirelessly uploads JPEG, RAW and video files to any folder on a computer (PC or Mac) and to the Web. Photographers on-the-go can also take advantage of its direct to computer (ad hoc) connectivity capabilities for direct uploads from camera to the computer without the need for a router. Organizing is made easy through lifetime, automatic geotagging (using Wi-Fi Positioning System or WPS), which enables users to view, search and share photos on maps and take advantage of a seamless integration with iPhoto ’09.